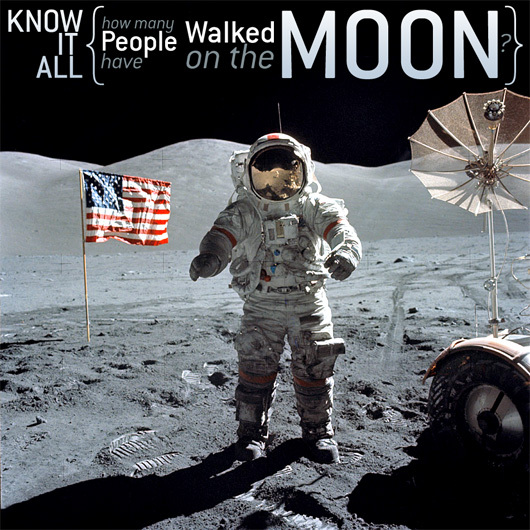 Know It All: How Many People Have Walked on the Moon? Everyone knows Neil Armstrong walked on the moon. Well, he may have been the first but he certainly was not the only man to ever set foot on an astronomical object other than the Earth. Most everyone knows (or should know) that the first men to set foot on the moon were Buzz Aldrin and Neil Armstrong, on July 21, 1969. For some reason though, the names, dates, and missions of all subsequent lunar visits were not nearly as well-publicized as the initial success of the Aldrin/Armstrong-led Apollo 11 – somehow, even when it comes to landing on the freaking moon, people became jaded and uninterested rather quickly. The Apollo program was conceived in 1960 and the first of the twelve manned missions disastrously never even made it to the launchpad as a fire claimed the lives of all three astronauts onboard the command module during a training exercise, in 1967. Thankfully, the tragedy of NASA’s first attempt was the only one of its kind, as all ensuing Apollo missions posted an unblemished record of astronaut safety. It wasn’t until the aforementioned Aldrin/Armstrong-led Apollo 11 mission, however, that the dream of a man actually walking on the lunar surface was finally realized (the intervening Apollo missions included a mixture of propulsion tests and manned missions that orbited the Earth and the moon). Every manned moon-bound Apollo launch that followed Apollo 11, with one notable exception, accomplished the objective of touching down on Earth’s only natural satellite – a total of six successful missions between 1969 and 1972. With two moonwalkers per mission, that means twelve astronauts were able to make the greatest claim a human being can make; Neil Armstrong, Buzz Aldrin, Alan Bean, Pete Conrad, Edgar Mitchell, Alan Shepard, James Irwin, David Scott, John W. Young, Charles Duke, Eugene Cernan, and Harrison Schmitt. Additional facts: Armstrong was the first to arrive, Cernan was the last to leave, Duke was the youngest (36 years, 6 months), Shepard was the oldest (47 years, 2 months), and – with the exception of Conrad, Shepard, and Irwin – all of these men are still alive. Why didnt they ever publicize the remaining moonwalkers? I think they are just as important. Its unfortunate because I was completely unaware of these men. .-= Muscle Max´s last blog ..Muscletech Gakic, 128 Caps, 1 Bottle =-. How sad! I was born near Jacksonville, FL in 1964. I distinctly remember watching the various flights go up from a distance- whether standing in the schoolyard, or during vacation on the beach. These persons were all known to us. We heard about the mission in school, who was going, who was on the moon. Even in pre-school our teachers showed us pictures and talked about it. I’m sure they even named names! By 5th grade we would recite the names by memory as if reciting the names of presidents, of continents, oceans and seas, or countries,I was fortunate to grow up watching those amazing flashes in the sky rise ever upwards, and the eyes of those astronauts were the stars in my nights!